Orange County Wellness Coordinator Training to Improve Worksite Health Available Friday, April 12 in Middletown, N.Y.
GOSHEN, N.Y., April 4, 2019 – The Orange County Chamber of Commerce is pleased to announce the upcoming Orange County Worksite Wellness Summit taking place on Friday, April 12, 2019. The one-day training program will take place at Orange Regional Medical Center Community Health Education Center in Middletown, N.Y. from 8:00 a.m. to 3:00 p.m. The Orange County Worksite Wellness Summit is a collaborative effort among the Orange County Chamber of Commerce, Orange Regional Medical Center, the American Heart Association, the Alzheimer’s Association, Eat Smart New York, SNAP, HealthlinkNY, Pow-r Against Tobacco, the Alcoholism and Drug Abuse Council of Orange County and Healthy Orange. 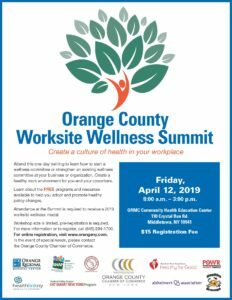 Together, these organizations have teamed up to provide a comprehensive day of education, information and inspiration to all participants who wish to provide worksite wellness programs and support to their business, school or organization in Orange County. The partners working on the upcoming Wellness Coordinator training are dedicated to creating a community that actively embraces healthy living by promoting wellness and influencing policy change. By working together, the organizations are utilizing a Collective Impact Model – a best practice for solving complex, pressing social issues such as the ones facing Orange County. This training will feature speakers that specialize in advocacy, stakeholder engagement, wellness committee development, health policy implementation and turn-key worksite wellness programs. The training will include several local worksite wellness success stories. The afternoon highlight will be an energetic speed networking session with seven of our county’s worksite wellness programs that are ready to assist local businesses and schools in creating a culture of health. The training will conclude with a commitment exercise and a very exciting challenge being offered up to all in attendance. Building a culture of health in the workplace through worksite wellness programs can help achieve improved health for employees and their families keep healthcare expenses down, and help increase productivity and decrease absenteeism. We’re happy to be a part of this program!” said JoAnn Parker, Regional Director, American Heart Association. This entry was posted in Community, Events, Health & Wellness, News. Bookmark the permalink.